Co. Kilkenny: Burnchurch, Callan (7), Donemaggin, Grove, Kells, Killamurry, Kilmaganny (2), Kilmanagh, Knoctopher (2). Co. Tipperary: Ballingarry (4), Lismolin, Mullinahone (3). The Board also included 8 ex-officio Guardians, making a total of 33. The Guardians met each week at noon on Saturday. The population falling within the Union at the 1831 census had been 42,707 with divisions ranging in size from Grove (population 1,061) to Callan itself (11,148). 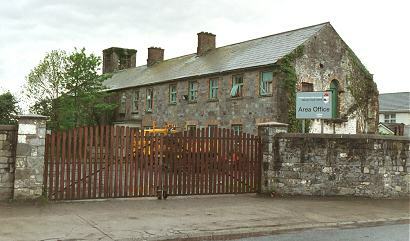 The new Callan Union workhouse was erected in 1840-1 on a six-acre site to the south of Callan. Designed by the Poor Law Commissioners' architect George Wilkinson, the building was based on one of his standard plans to accommodate 600 inmates. Its construction cost £5,500 plus £1,140 for fittings etc. The workhouse was declared fit for the reception of paupers on 21st December 1841, and received its first admissions on 25th March 1842. The site location and layout are shown on the 1930s OS map below by which time it had become a knitwear factory. The main buildings followed Wilkinson's typical layout. An entrance and administrative block at the east contained a porter's room and waiting room at the centre with the Guardians' board room on the first floor above. 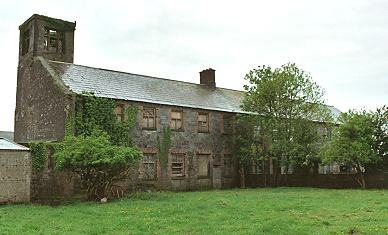 To the rear, the main accommodation block had the Master's quarters at the centre, with male and female wings to each side. At the rear, utility rooms such as bakehouse and washhouse were connected through to the infirmary and idiots' wards via a central spine containing the chapel and dining-hall. During the famine in the mid-1840s, sleeping galleries were erected, and stores, stables, and idiot cells appropriated to accommodate an additional 190 inmates. Fever patients were initially sent to a hired fever hospital building in Ballingary. A 69-bed fever hospital was later erected at the workhouse. 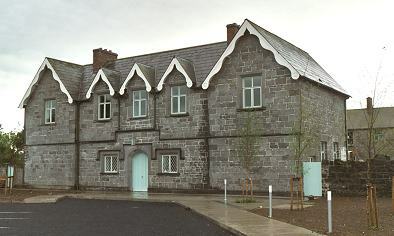 In the 1920s, following the formation of the Irish Free State, the workhouse was closed. The buildings were later converted for use as a knitwear factory. More recently, the entrance and accommodation block has been converted to office use. Part of the rear buildings are used as a council depot. Kilkenny County Library, 6 John's Quay, Kilkenny, Co. Kilkenny. Holdings include: Guardians' minutes (1839-1922); Letters from the Local Government Board (1898-1903, 1906).